Noumidia is a famous Amazigh music group originating from the Rif, Alhoceima. 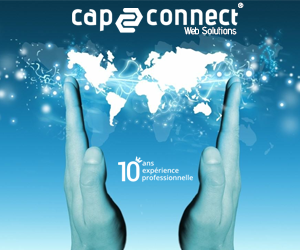 It was founded in 1994 by a group of five talented members. They have released two albums and they are currently working on the third one. Their main concern is the Amazigh case, identity and culture, which are pervasively present throughout their music. Noumidia believe that participation in Festivals is a good thing for the Amazigh music, and thus they have participated in many national and international festivals where they have given a good image to the Amazigh music in general. Like any other groups in the Rif, Noumidia faced and are still facing challenging problems which prevent them from achieving their desired goals. However, their strong desire to promote the Amazigh culture pushes them to work harder and overcome all the problems. 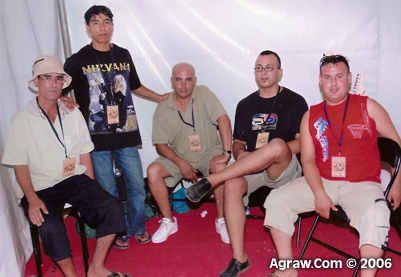 Again Agraw.com has tried to shed some light on one of the prominent music groups in the Rif, i.e. ‘Noumidia’. We have conducted an interview with the leader of this group in order to know more about them and also introduce them to those who do not know them yet. Agraw: Hello brothers and sisters. Today we chose a well-known group from the Rif, Alhoceima. They released two albums and they’re called Noumidia. To know more about this group, Mohamed Noumidia as a member of ‘Noumidia’, is going to talk to us about their history. Agraw: Could you please talk to us about ‘Noumidia’ group and why the choice of ‘Noumidia’ as a name to your group? Mohamed Noumidia: First, hello to all those who listen to us. We chose this name as it’s an Amazigh name and has a long history in Thamazgha (North Africa). We created ‘Noumidia’ in 1995. We’re in five members and each member plays his own instrument. We work together under one main dream and goal that is to send our message to all Imazighen where ever they are. 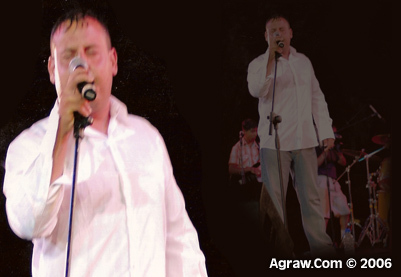 Agraw: We notice that your music treats mostly the Amazigh case and troubles. Why did you choose this road? Mohamed Noumidia: We chose this road because we are Imazighen. Our fathers and grand-fathers spoke Tamazight and we grew up in an Amazigh milieu, that’s why we sing in Tamazight. Our identity and culture are Amazigh, and hence, it is a must for us to sing about our origin. Agraw: As we have noticed the second album came a bit late. Can you tell us about the reasons and troubles you faced in making this second album? Mohamed Noumidia: I think all people know about the fact that we had troubles in making the second album. It was on the news and the Radio too. We had many problems with the editor. We were so serious about making the second album, but unfortunately we met unserious and narrow-minded people. Despite all these problems the second album was finally released. In what concerns the fact that the second album was late, I don t have any problem with releasing it in the summer or winter, it s not an obligation that we release our album in the summer time; the latter is the editor s opinion as the summer is full of activity and it is business time too. Agraw: Can you tell us about your view of music in the Rif? Mohamed Noumidia: Music in the Rif is the kind of music that is alive and will live forever. It lasts forever. It never dies. For example Idir, the Kabalylie singer, made music since the 70th and still his music is being listened to in a great deal generation after generation, this kind of music that is ever-lasting is what Ã¢â‚¬ËœNoumidia trying to opt for. 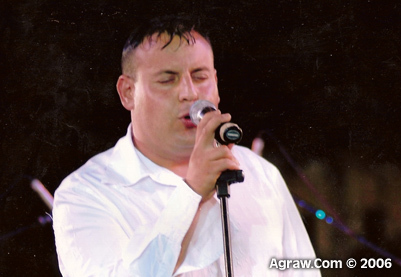 Agraw: What about singers in the Rif? Can you tell us about them? Mohamed Noumidia: In the Rif we have very talented singers who have nice voices and music. In what concerns their lives, you find them mostly ill, since they cannot achieve what they dream of. We have some editors who have their own ways of thinking that don t fit the singers in the Rif. All they care about is making money, while we as singers, our burden is to sing about our social problems, this way no editor would agree to help us in our music, only few of them. This is the life of singers not only in the Rif, but in all Morocco as well. Agraw: We have heard lately of many organized festivals where the Amazigh music was present too. What does Ã¢â‚¬ËœNoumidia think of these festivals? Mohamed Noumidia: It is a good initiative and a good step that the Amazigh music participates in festivals. Agraw: Is there any new album you re working on currently, any projects? Mohamed Noumidia: Our first album was out in 2001. The second one was made in 2003 but it came out until 2006 because of the problems we faced. Until now we have 8 ready songs for an album. We are willing to make a new album but it s just that we haven t found an editor yet. Agraw: Have you thought of making a video clip like the other singers do on TV? Mohamed Noumidia: Why not! I think it s a good idea to make a clip on TV. It s a good start. We thank god that our fame is not due to a video clip or something, but it s thanks to our music in cassettes, and serious work, and a clip would just add some fame to our group. Agraw: Can you tell us about the difficulties Ã¢â‚¬ËœNoumidia faces on its road? Mohamed Noumidia: There are many difficulties that we face. For example in making al album, we don t even find where to prepare and make tests, we just play outside in nature and mountains. In fact there are many difficulties, but thank God we still make our music and we never give up. Agraw: As we reached the end of this interview, do you have any message to pass to your fans? Mohamed Noumidia: I have a message to pass not only to those who listen to Ã¢â‚¬ËœNoumidia but to all those who care about Tamazight and encourage it. We thank them so much. It is the audience that helps the Amazigh song survive in a great deal. Agraw: Thank you so much brother Mohamed. 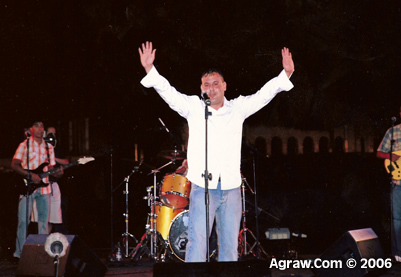 Mohamed Noumidia: Thank you Mohamed and thanks to all the people who visit Agraw.com which is a very nice website for all Imazighen, and for which we hope a long life. Special thanks to Hicham Boughaba for the translation & Miloud Ayadi for the pictures.